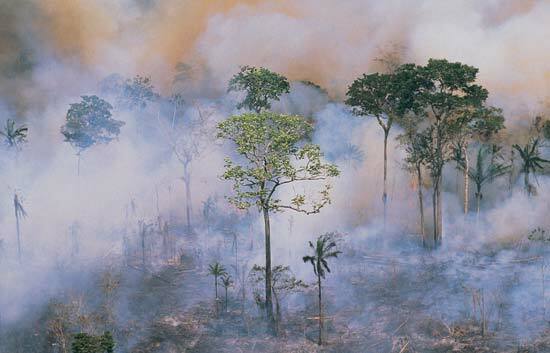 Slash and Burn Agriculture - The Arson Of Mother Nature for Profit! The slash-and-burn agriculture practice has been in use since the early history of wide-scale farming and still is the main form of producing crops and cattle to this day. It is an agricultural technique that involves the cutting and burning of forest land to turn it into arable land for crop fields. It is a technique dating back from 10,000 years BC. Slash-and-burn agriculture is the most widely applied model in agriculture today and provides food to billions of people around the world. It is cheap and its long usage throughout the years has lead to a development of various techniques (and technology) to maximize the efficiency of this model. It is quite obvious that cutting and burning down a forest to later produce crops is taxing on the environment, so in places like Madagascar people innovate as much as possible to try and make the overall gain outweigh the losses. Workers subdivide the land into distinct portions for being cultivated and for being left uncultivated, then shift between the two pieces of land according to planting cycles and seasons. When the uncultivated land has grown to a certain point where the soil is nutrient rich and fertile, slashing and burning is then applied. The leftover ashes from the burnt foliage then add a layer of nutrients to the soil, which makes it fertile for farming. This method prevents the unnecessary burning of more forest. In many parts of Africa, including Madagascar, agriculture, and charcoal production industries are closely intertwined, making sure that the burned wood can be further used for energy production rather than being wasted. Aside from all its benefits it also has many drawbacks - It has led to the extinction of many animal species, loss of habitat and, and soil infertility which increases the demand for more fertile soil accelerating the process of deforestation. The main reason why we still employ such an environmentally taxing form of producing food is that we choose to. We usually don’t question the path our food takes before ending up on our plates. Food becomes something that is no longer gifted to us by nature, but rather an object of insignificant origin from an arbitrary supermarket shelf. In worst case scenarios slash-and-burn agriculture might not be always so evil. Where there is no direct access to fertile land employing this model to produce food might be the only way to survive. Thousands of years ago this method was the main way of supplying food to the local communities. However, nowadays we are losing upwards of 80,000 acres of tropical rainforest daily, and significantly degrading another 80,000 acres every day on top of that. As the forests fall, we are losing some 135 animal and plant species every day—or some 50,000 species a year. Ultimately it boils down to two things: the scale on which this model is employed and the precautions which are taken to prevent the destruction of habitat. As far as alternatives go for the slash-and-burn model, there have been many developments over the last couple decades among which one of the most promising ones is hydroponics. It has minimal impact on the environment and animal species and it involves no cutting of forestry to obtain fertile soil. In fact, it involves no soil at all! In a hydroponic setup, a mineral nutrient solution and artificial LED lighting provide all the vital compounds and energy for plants to grow. This method has a very small water and carbon dioxide footprint and uses water much more efficiently than the standard agriculture practices. Maintaining a hydroponic garden requires no special environmental conditions and can be set up in areas suffering from infertility, saving the local communities from famine and poverty. What is so exciting about such ways of producing food is that it is becoming increasingly available to the general public. Aquapioneers, a project based in Spain, has developed what they call the first open source aquaponics kit. Combining the ecosystems of a fish tank and a small garden Aquapioneers have come up with a fully sustainable means to produce fresh vegetables and reconnect city dwellers with the production of their food. To bring it to the next level, a Florida-based company, PermaCube LLC, is working on the PermaCube, a food growing, processing, and storage facility which employs multiple permaculture techniques to maximize yield in a limited space. Though this kind of technology has many advantages when it comes to saving the environment many remain skeptical about such artificial means of producing food. It may be really common for someone to feel disempowered and have no agency over the choices we make as consumers. However, from the new trends of consumption that are emerging, be it the plant-based movement or high demand for organic and fresh food, it is quite obvious that people respond pretty well to honesty and transparency. Food produced using these techniques has had great commercial success in the last decade and if smaller agriculture companies continue reacting to these trends it might end up being a primary source of food to an even greater percentage of people. From a business standpoint, it is definitely harder to compete with companies who produce food through the slash-and-burn method because it is sold for less, so consumers find it inconvenient to question its origin and the negative impact it has on the environment. As for the damage that has already been done reforestation organizations such as 'Eden Reforestation Projects' and campaigns like 'Plant a Billion Trees' are helping to restore the ecosystem and reduce the impact of slash and burn in different parts of the world. Finally, it is crucial to remember that as consumers we are in charge of the demand and eventually the supply of goods so the agricultural model and sustainability projects we choose to support impact the welfare of the ecosystem and generations to come and shapes the future.